Home Print Labels for Mac is label design software with most of the Avery labels and cards formats support and powerful mail merge feature. Home Print Labels for Mac supports various barcodes and can be used as barcode generator for Mac OS X. Easy switch between mac database and label views, instant previeweing make the work with the label maker intuitive and quick. You can print labels from either a database, or from predefined data template. 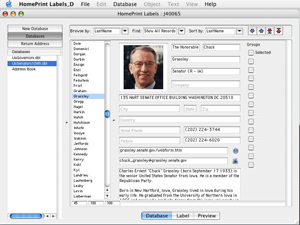 Home Print Labels for Mac is professional label design maker for Mac OS X. Powerful mac database feature allows creating and saving databases that make it easy to enter names from you keyboard or import them from another program. Databases can hold up to 32.000 records, and allow you to filter, group, sort, and search for records in a fraction of second. You can easily split, merge import and export mailing databases. Cristallight Home Print Labels is a innovative print and mac label design maker, tool which will allow you to make address labels, mailing labels, shipping labels, letterheads, Form Letters, business cards, ID cards, Inventory Tags, postcards, and envelopes and more. *The more of avery labels, cards templates. Qweas is providing links to Home Print Labels for Mac 2.0.0 as a courtesy, and makes no representations regarding Home Print Labels or any other applications or any information related thereto. Any questions, complaints or claims regarding this application Home Print Labels for Mac 2.0.0 must be directed to the appropriate software vendor. You may click the publisher link of Home Print Labels on the top of this page to get more details about the vendor.